hy are grasshoppers so bad this year, again? Consecutive years of hot, dry summers and warm, dry autumns favor grasshopper survival and reproduction. Warm, dry fall weather allows grasshoppers more time to feed and lay eggs. The large numbers of grasshoppers present last fall left many eggs in the soil which hatched this spring. Also, rains in the spring when eggs are hatching drown young hoppers. Thus, dry weather in the spring favors their survival. Where do grasshoppers come from? Grasshopper eggs are deposited in the soil l/2 - 2 inches deep in weedy areas, fencerows, ditches and hay fields. The eggs hatch in the spring and early summer. Eggs of different grasshopper species hatch out at different times, so young grasshoppers can be seen throughout the spring and early summer. Young grasshoppers, called nymphs, feed for about six weeks. Once nymphs reach the adult stage, they can fly. As weedy plants are consumed or dry in the summer heat, adult grasshoppers can fly from weedy areas and pastures to more succulent crops and landscapes. When will grasshopper numbers decrease this season? Although grasshoppers complete only one generation a year, eggs hatch over a long period of time. Development from egg to adult requires about 40-60 days. Also, eggs of different species hatch at different times so small grashoppers can be found throughout the growing season. Grasshopper can persist until late fall when old adults begin to die or when a killing frost occurs. What can be done to reduce their numbers? Weed control. Eliminating weeds will starve young hoppers and later discourage adults from laying eggs in the area. Destroying weeds infested with large numbers of grasshoppers can force the hungry grasshoppers to move to nearby crops or landscapes. Control the grasshoppers in the weedy area first with insecticides or be ready to protect nearby crops if they become infested. Grasshoppers deposit their eggs in undisturbed soil, as in fallow fields, road banks, and fence rows. Shallow tillage of the soil in late summer may be of some benefit in discouraging egg lay. Grasshoppers are susceptible to many insecticides. However, insecticides typically do not persist more than a few days and grasshoppers may soon re-invade the treated area. The length of control will depend on the residual activity of the insecticides and the frequency of retreatment. Controlling grasshoppers over a large area will reduce the numbers present which can re-infest a treated area. Dimilin 2L provides long residual of young hoppers but is not effective against adults. When should insecticides be applied? Monitor grasshopper infestations and treat threatening infestations while grasshopper are still small and before they move into crops and landscapes. 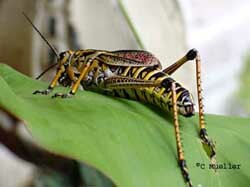 Immature grasshoppers (without wings) are more susceptible to insecticides than adults. What about insecticide baits for grasshopper control? Sevin 5 Bait is a ready-to-use bait which can be applied to many crop and non-crop sites, including around ornamentals and many fruit and vegetable crops. For those wanting to make their own grashopper bait, the labels for Sevin XLR and Sevin 4-Oil ULV provide directions for mixing these products with cereal grains to make a 2% to 10% carbaryl bait. The bait is labeled for use in rangeland, wasteland, ditch banks and roadsides. The label further states the bait is for use "only by government personnel or persons under their direct supervision (e.g. USDA, state and local extension personnel, etc.)" Are biological control products such as Nolo Bait, Grashopper Attack, and others effective? These products contain spores of a protozoan called Nosema locustae, formulated in a bait. Grasshoppers consuming the bait become infected by the Nosema organism. Some immature grasshoppers die while adults often survive but females lay fewer eggs. Nosema baits act too slowly and kill too few grasshoppers to be much value when the need for control is immediate. Permethrin. Active ingredient in Spectracide and other products. Acephate. Active ingredient in Orthene (at present, but being phased out). Note: Tempo (cyfluthrin) and Demon (cypermethrin) are labeled for use by Professional Pest Control Operators (2003) for insect control in lawns and landscapes. What insecticides can be used in ornamental production? Several products may be used including those containing bifenthrin, lambda-cyhalothrin, diazinon, dimethoate, malathion, acephate and carbaryl (2003). For more information, see: Extension bulletin L-5201, Grasshoppers and Their Control.